Carbonade flamande is a simmered or baked dish of beef, onions, beer (and sometimes stock) and, often, vinegar, sugar, and herbs. Mustard is often added. A thickening of some kind is usually present, bread, flour, or another starch. Spelling varies, you will also see carbonnades flamande, or à la flamande, and the noun in singular or plural. The dish is a star performer in the cookery repertoire of the old region of Flanders, an area which straddles three countries: the far north of France area around Lille and Pas-de-Calais, Belgium, and Holland. Carbonade flamande is perhaps the best-known dish of beer cookery, rivaled only by Welsh Rabbit, a melted cheese and beer dish. There are many recipes in countless books and online. Most are similar in their construction but I find the variations can make a difference. I will set out the recipe I feel gives the best result. I stick to beef vs. other meats as I find the dish is best with beef, but it is interesting to try it with pork or veal, say. “Carbonade” seems to derive from carbonado, and one easily sees the connection to charbon (coal), carbonized, and similar words. Hence carbonade was meat cooked over a bed of coals or burning embers, not a stewed or baked dish as it is today. How these shifts occur is one of the mysteries of food history. Sources from the slightly later Edwardian era, including impressively Escoffier, remark on the dish as a Flemish (Belgian) specialty cooked with “old lambic” or another Belgian beer of the acid, lambic group. Probably the “vinegar” in older recipes was sometimes a Belgian sour beer. The fact that vinegar is called for today when using a standard ale or lager makes sense as the combination emulates the sour taste of lambic or gueuze. So in all likelihood the dish is not a 20th-century invention but goes back hundreds of years in Flanders where sour agents – vinegar, acid beer, or verjuice (sour grape juice) were used in cooking. 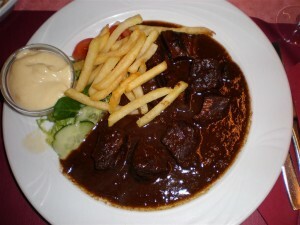 In general, carbonade flamande is a survival of medieval cooking practices, many of which had a sweet-and-sour signature. I give my recipe in summary form only but in a way any moderately experienced cook can follow. It is not actually mine but from a Belgian beer cookery book dating back to the 1970s or 60s I looked for it but can’t find conveniently find it, it is in a box somewhere. Still, the thousands of recipes you can find for beef carbonade are similar, differing often in a detail or two. Some add bacon (I don’t think it helps the dish), some mix beer and stock (I like beer only), some use ginger, nutmeg, or mace instead of green herbs. A note on the beer: It may sound odd on a beer blog to suggest it, but the beer doesn’t really matter. I have used lambic, porter, Imperial Stout, Coors Light, and everything in between. If you use the sugar, vinegar, and mustard, which you should, it all comes out similar. So my rule is, I use any beer I have, or a blend of leavings – almost anything. A dash of whisky, brandy, port or gin is good too, but don’t add too much, you don’t want a “brandied” overtone. You need a kilogram (2.2 lbs) of beef, a second cut like chuck, round, shoulder, shank. It can be sliced in half-inch slices or in chunks. I like chunks. You can flour the meat or not. Sauté it to a medium brown in a pan. Don’t add too much beef when browning else it will “steam”, do it in two or three batches. Slice yellow or white onions, four or five, sauté them in more fat, any kind will do but I find butter is best, maybe mixed with olive oil. Some people like the onions browned, I find it better to have them translucent. Transfer the meat and onions to a casserole dish, I use the oval enameled type. A Creuset-type is good as well but watch the cooking time, as the extra insulation holds the heat and these vessels need less time to avoid a drying out. In a pot on the element pour an Imperial pint (20 oz) of beer or more, you may need about 30-35 ounces. Add the vinegar, a few tablespoons. Any kind will do but a good red wine one is best, and the sugar. Sugar is important, you need at least a tablespoon, it modifies and mingles with the beer and vinegar to produce the classic sweet and sour palate. The sugar can be white or brown, even maple syrup works. In a pinch, honey or molasses. Add a rounded teaspoon of mixed dried herbs – the mixture is important – and a bay leaf or two. The herbs can also be in bouquet garni form. Bring all to a boil and skim, this is also important, it makes for a better dish. Pour hot beer mixture onto the beef and onions in the baking dish. Next, take a couple of slices of semi-stale but good bread, any whole grain type say, and cover well with a Dijon or any good mustard. Place slices of bread mustard-side down on the top of the mixture, the liquid should come to near the top lapping the bread. Cover and bake at 325 F or even 350 F for a couple of hours, I find at 350 F sometimes barely more than an hour is enough, but test meat until it is cooked but still firm. Cooking will take more or less time depending on the meat, your oven, etc. It is better to let the dish cool on the stove, then remove any noticeable fat, and then place in fridge and reheat well the next day. Proverbially such dishes improve over a day or two. I should add: half-way through the cooking blend everything with a spoon, you will see the bread disintegrates and helps lightly to thicken the sauce. Also, salt and pepper at outset but don’t over-salt, you can always more later but too much salt will ruin the taste (for any dish). I don’t like garlic in this dish. Some Belgian recipes use a spice bread, a gingerbread-type, for the thickening element. I have tried this but don’t think it is better than using good whole grain. The idea is to lightly thicken the sauce. If you like the ginger taste, add a little grated or ground ginger. Drink the braise with any beer you like or a red wine that can stand up to a sweet and sour dish. A good Zinfandel, or Beaujolais, say. Riesling works well too actually, a Spatlëse, say. Brussels sprouts lightly steamed or boiled with butter, or cabbage sections cooked the same way, are traditional to accompany. Plain boiled potatoes, or noodles buttered, or the classic French fries of Lille and Belgium, also. French fries may sound odd with a braise but they are classic for this dish. One thing I would advise: don’t mix too many flavours, you may get a muddled result. Escoffier’s fairly simple recipe (see pg. 398), from 1904, employs the classic lambic but is otherwise quite basic. Taste is heightened and improved as a result, imo. Note: For those who wish to adding bacon or nutmeg, mace, or ginger this French recipe looks good. It calls for a liter of Pelforth Brune, a sweetish, dark beer. Leffe Brune, a Belgian abbey-type, can be used or a similar beer for yet a “sweeter” taste. You can adjust sweetness with less or more sugar though, that’s why the beer doesn’t really matter except perhaps at the extremes, Bud Light vs. an imperial stout, say. Note re image: image appears to be in the public domain and is sole property of its lawful owner, as applicable, it was sourced here. Image is used for educational and historical purposes. All feedback welcomed. *I documented some of these in a later post, here. Thanks Barm and I’m always reminded of a story by the American cookery writer Richard Olney. (See https://en.wikipedia.org/wiki/Richard_Olney_(food_writer). He had a place in south of France for many years. The day after a party, this is circa-1970, he collected the ends of all the wine bottles from the night before. Some were (now flat) Champagne, some red, some white, etc. He combined them and used them for a burgundy beef dish. He said it was the finest he had ever made. It sounds sort of similar to sauerbraten. Now that you mention it, I have a recipe for sauerbraten that is based on beer, not wine as is the custom. I’ll write this up soon, perhaps. Nor can one dismiss it as a dispensable North American do-it-yourself, as the recipe comes direct from Germany although it does involves Americans and indirectly the Second World War. I’ll return to this soon, I hope. I am sure you are right and the vinegar in contemporary recipes is there to imitate the flavour of a more acidic beer used in the past. I have never seen any sense in the adage “don’t cook with a [wine] you wouldn’t drink”. Cooking is the perfect way to utilise beer that has become too sour to drink, has gone flat, etc. I doubt very much that people of the past were pouring their unpalatable beer down the drain.